In the great debate of Target vs Walmart, I believe it all comes down to preference. For the longest time, though, I was shopping at Walmart because I believed I couldn’t afford to shop at Target. Now that I know how to save money at Target, you’d be hard pressed to find me at Walmart. It’s been a number of months since I set foot in a Walmart. It used to be the final stop on our Saturday night date night before we had kids, and I would always complain about something. About 75% of our grocery and household items used to come from Walmart. On the other hand, I am fairly certain we used to spend less than $100 each year at Target. I absolutely love the atmosphere at Target, but I was spending my time and money at Walmart because I had this deep impression that I could not save money at Target. When I came to a breaking point last year with Walmart, I decided to give Target a second chance. I wasn’t about to start grocery shopping there, but I was willing to spend some money there for our other needs. I realized that the quality of Walmart products was pretty low. I was tired of the long lines and mean customers. The Walmart near my house is less than appealing. Target is less than a mile from that and has a much more inviting atmosphere. I tended to overspend since everything that I needed was there. I was always in a bad mood as I left the store. When I went to Target last year to buy something I would normally buy at Walmart, I finally signed up for the Target REDcard. Since that time, I’ve discovered a number of other ways you can save money at Target. It’s incredibly satisfying to finally be shopping at the store of my choice and still be able to spend the same or less as I was at Walmart. If you’re looking to save money at Target, too, here are some of the ways I found you can save there. At the very least, you should never pay full price for anything at Target if you get the Target REDCard. I opted for the debit card because it deducts money straight from my checking account, and I still get to enjoy 5% off everything. First of all, and this should go without saying, buy only what you need. Also, never enter that place without a list. I know it’s fun to take the kids when there’s nothing else to do, but I’ll bet you buy more nonsense when you do that. Shop clearance racks and shelves – learn when you are buying at the absolute best price by finding out your local Target’s markdown schedule. Get your holiday/seasonal items after the event. Take advantage of free gift card deals offered on certain products. Use a Target REDcard (debit card) to get 5% off everything. Check the $1 bins for things you need. Ask for a rain check on an item that is out of stock but on sale. Know when the best sales happen. Be sure to find out when your local Target does the 70% off Toy Clearance (especially if you want to add more toys to your gift closet). Watch as they ring up your purchases to make sure the prices are what you expect. Use the Cartwheel app to find coupons on items you are buying anyways, and get some cash back by using ibotta (referral link). Also they have mobile coupons if you sign up to get them. Only buy food there if you know it’s cheaper than shopping at the grocery store. How will you know if the food is cheaper at Target vs grocery stores? You keep track of the price of food in a price book. Shop through Ebates (referral link) or Giving Assistant for cash back and/or coupon codes. You can also use the RetailMeNot app for even more coupon codes. Use the Cartwheel app, ibotta, and mobile coupons. Subscribe for 5% off. This is just like Amazon’s subscribe & save. Use a Target REDcard (debit card) to get 5% off. You’ll get free shipping, too! Browse what is on clearance. Before you make your purchase, get a discounted Target gift card to save even more money. You can buy discounted gift cards from a website like Cardpool (5% off when I checked) or GiftCards.com (6% off when I checked). 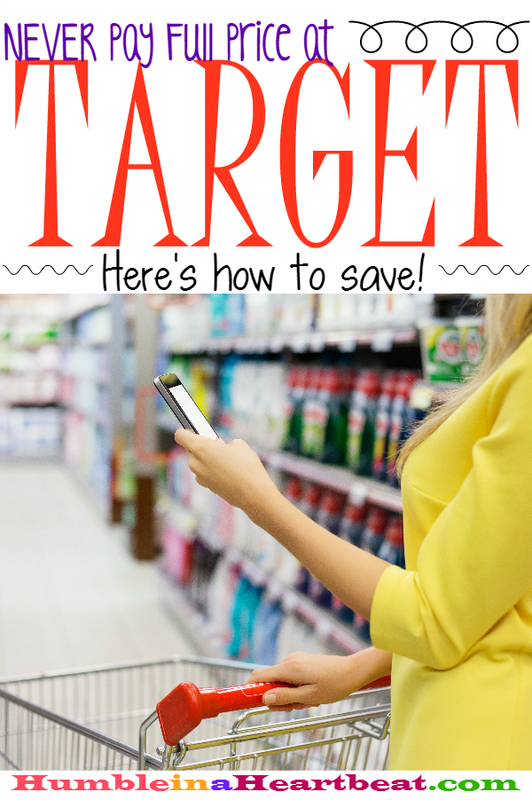 Do you know of any other ways you can save money at Target? Good tips! Target Cartwheel & Ibotta are the best! I have saved so much with combining the 2 apps. Thank you, Emily! I just gotta get a smartphone so I can actually use them! Great tips! I also much prefer Target to Walmart. Thanks, Leesha! I am sure that’s the consensus with most of us ladies. My husband, on the other hand, could live at Walmart. Ha! I am not a fan of Walmart either. It just makes me grumpy when they don’t take my coupons so I rarely shop there. Great list on Target saving strategies! I appreciate it, Kristen! I don’t use coupons, so I didn’t know that was a problem. I would be pretty upset too if they didn’t take coupons I spent time to find, especially if I made a special trip to Walmart to use them! I feel the same about walmart. Walk into walmart on cloud 9, walk out missing my soul. Lol. I absolutely LOVE target. To avoid walmart ive been shopping alot on amazon. Target is awesome. I love stacking clipped coupons, with their coupons, and if their a cartwheel AND giftcard deal. I walk out feeling like i won the lotto. Hahaha. I really love how clearance thing at target actually feel like a bargain. Ive seen walmart mark a product off by 2cents and call it clearance. The only thing i get at walmart now is yarn. I usually get at a hobby store but i dont have a vehicle anymore so stuck with walmart or amazon. Target employees are soo friendly. Every other isle im asked if i need help, or just a plain hello. Even managers offer assistance if they walk by. I love it. With walmart employees are either MIA or in a unhelpful heard.